This multi-service building was opened in 1992. It is owned and run by the As Pontes town council. It is a three-storey building with a basement and in the latter there is an exhibition hall, a computer room, dressing rooms and several store rooms. On the ground floor there is a 218-seat events room, which can also be used as an assembly hall, with a small stage facing the seating area. A wide range of activities take place here, such as concerts, plays, dancing, conferences, talks, meetings, assemblies and, in broad terms, any sort of small-scale cultural event or performance. The Culture Department offices are located on the first floor as well as a large storage space. On the second floor, the As Pontes Social Services Department have their offices. Moreover, there is a multi-use hall and some lavatories. Finally, on the third floor there is a dance room and a machine room. Inaugurated in 1951, as a so called semi-luxury cinema theatre, it was subsequently bought by the As Pontes council in 1989 with a view to being used as a Municipal Auditorium. After undergoing gradual refurbishing, it was substantially remodelled in 1996: the stage space was extended and roof above the stage was raised in order to improve the already existing excellent qualities for creating scenographies needing medium-sized sets. After that, acoustic insulation was improved and the entire stage was redone, a black box was installed, trusses were put in place and proper entrances were built. The Municipal Auditorium has left its birth as a commercial cinema theatre behind and is nowadays used for setting up plays, showing films, hosting music and dance performances as well as talks, lectures, and other kinds of events and assemblies. It is furthermore used as a rehearsal space by different local performing culture groups. Because of its size and facilities, this Auditorium is fit to be part of proper theatre networks and able to host professional shows on tour. The Cine Alovi Municipal Auditorium is owned and run by the As Pontes town council. It is a roofed indoor with the stage facing the seating area. The Auditorium has also got a ticket office and dressing rooms. This exhibition hall is owned and run by the As Pontes town council. It is a roofed indoor venue of approximately 130 square metres with a store room, a special black room for audio-visual projection as well as lavatories. The venue is intended for small events and exhibitions and is frequently used thanks to its versatility. A culture building accomodating a large number of books which offers rooms and spaces designed to facilitate easy and comfortable reading experiences or to do other tasks like school homework or assignments. Situated under Plaza de América or Plaza Roja, the library has got three reading halls and one consulting room. It is likewise the home to the Alalá Poets Association. Winter hours: from Monday to Friday from 9 a.m. to 9 p.m., Saturdays from 9 a.m. to 1 p.m.
Summer hours: July and August Monday to Friday from 9 a.m. to 2 p.m., closed evenings and Saturdays. The As Pontes de García Rodríguez Professional Music Conservatory has been carrying out its teaching work since the academic year 1989/1990. 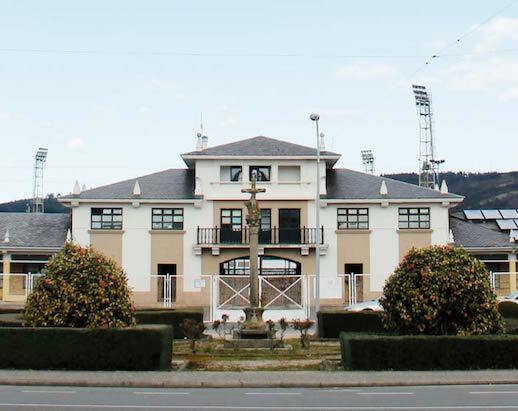 It is located in Poblado das Veigas, in the old Endesa school. A Feira do Grelo (The Turnip Greens Fair), enjoying today a great reputation in the entire Region of Galicia, was born in 1981 as the result of an initiative taken by the Town Hall and the Municipal Festivals Committee. In light of the industrial boom and the gradual loss of traditional agriculture, a decision was made to promote one of the area’s most typical agricultural products: the turnip green. It has been held yearly ever since, every Carnival Sunday, attracting thousands of people from all over Galicia. A wide variety of activities take place all through the day featuring events like the Turnip Green Contest, Handicrafts and Gastronomy Exhibition, parades as well plenty of different turnip greens based dishes on offer. The As Pontes town hall Carnival Celebration is held so as to encourage local residents to participate with the idea to strive to recover its traditional and popular nature. The As Pontes town council organises a Floats Festival and a Carnival Parade. As Pontes is the only Galician inland town honouring the Virgin of Carmen (the Virgin of seamen) by holding a Patron Saint Festival in her name. This celebration has been held since the 16th of July1741. Parades, open-air dances, culture and sporting events filling the streets of the town with a bustling crowd take place for several days. The so called Night Procession, commencing at the Chapel of Carmen on Saturday evening during the Festival, carrying an ancient image of the Virgin of Carmen to Saint Mary’s Church is particularly important and worth highlighting. The image is then returned to the chapel on Sunday morning, with the bearers walking on a large flower carpet. Marking the end of these celebrations on 24th and 25th of July, is the traditional Romería de La Fraga. For two days, this splendid eye-catching municipal Oak-tree forest hosts the pilgrims’ wooden huts, providing shelter and allowing them to eat, rest and sleep there. The outdoor mass, the bagpipers, the orchestra and the Folk Music Festival are but a few of the colourful ingredients of this festival. The mushroom and fungus festival is held on the 1st of November. There is not only a mushroom contest and display, but at the same time there are plenty of other activities such as mushroom tasting, mushroom picking in nearby forests as well as lectures and exhibitions featuring these delicacies.